Disney World has announced new additions coming to Downtown Disney starting on March 5th, 2010. Just in time for the debut of the new Alice in Wonderland movie on March 5th, AMC Entertainment is upgrading auditorium #1 to be the first Enhanced Theater Experience (ETX™) in the United States. The ETX auditorium will include a 20 percent larger, floor-to-ceiling screen, 3D technology, 12 channel audio and digital projection that delivers higher resolution than HD. Opening on March 25th will be a new retail addition to Downtown Disney's West Side. RIDEMAKERZ will integrate full-sized cars and a supercharged interactive experience that lets guests build, customize and trick out their very own radio-controlled vehicles. Kids of all ages will be able to satisfy their need for speed with over 649 million ways to create a mean machine. This will be the 6th U.S. location for RIDEMAKERZ. Current plans are for this Downtown Disney location to be temporary and only be around until Fall. 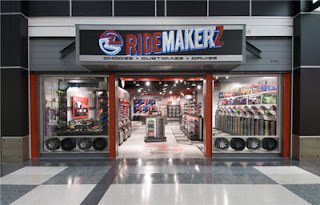 Having personally visited the RIDEMAKERZ located in Myrtle Beach, SC I have to admit that this is a pretty cool shop, where you make your own customized RC car by choosing from a wide variety of styles and options. D Street will build upon the success of Trend-D in the Downtown Disney Marketplace. Different from Trend-D is the fact that D Street will have merchandise for both men and women. It will have urban inspired products mixed with a Disney creative flair. The store will have edgy apparel, pop culture novelties, Vinylmation™ figures and collectibles, artwork, handbags, accessories, jewelry and more. Opening in April, the D Street will feature a raw, unfinished industrial look and provide a great venue to showcase Disney art created by local artists. Downtown Disney continues to be a place for entertainment, shopping, and dining while visiting the Walt Disney World Resort. These newly announced additions build upon the others recently added attractions like Characters In Flight, Paradiso 37, Trend-D, and the recently announced Pollo Campero. 0 comments to "Downtown Disney To Add 2 New Shops And 3D Theater Technology"